Yesterday's post got me thinking about a problem that we solved at an asphalt batch plant that I used to work with. Every so many loads they were seeing a dry batch. We checked the aggregate feed, oil system, pug mill, and computer system but couldn't find the problem. Months later after talking to a plant superintendent we figured out what the problem was...and it was simple, just like 99% of the problems you're going to see. The problem was how the mineral filler, or minus #200 fines were being distributed into the bins. On this particular batch plant, the mineral filler was not metered in with an automation system like you might see on more modern setups. Instead, a certain portion would be pushed onto the bucket elevator with the rest of the aggregates on their way up to the top of the batch tower to be deposited onto the screen. Each bucket in the elevator did not get an equal amount of mineral filler, and often it would not deposit any mineral filler on 2-5 buckets and then a bunch of it onto one bucket. When we were looking at the system earlier we had figured that this had nothing to do with the dry loads because the screening process before the bins would distribute the mineral filler out as it was screened. However, if you've every felt mineral filler it can become very sticky if it isn't kept at a high temperature. Acting almost as a clay-like product. 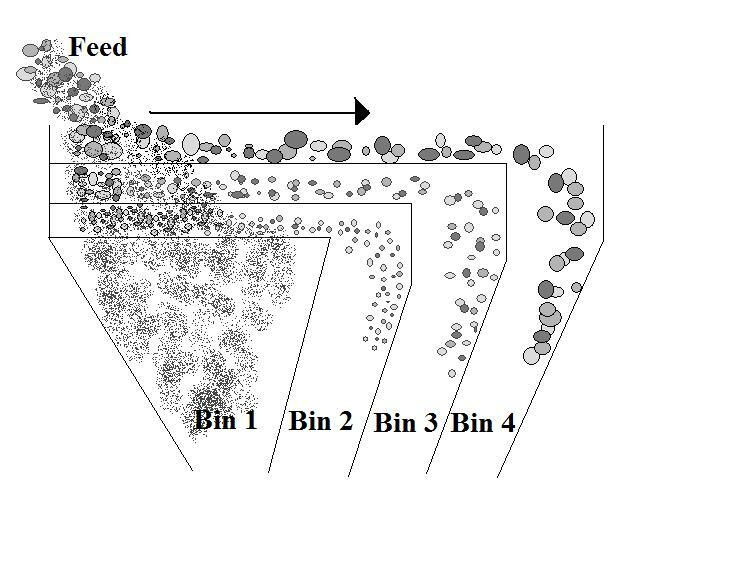 Before I go any further I want to show you a diagram of what the screening process looks like and how the materials are seperated out into bins. As you can see, the feed from the bucket elevator deposits all of the aggregate, including the mineral filler, at once onto the far left side of the screen. As the screen vibrates the rock is moved to the right along the screen and the smaller rocks fall through each deck, separating the different rock sizes. 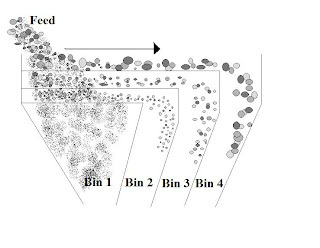 You can also see that the fine aggregates, usually rock smaller than 3/8" drops into Bin 1. Generally, the smaller the aggregate, the faster it drops through the screen decks. In other words, the mineral filler doesn't travel very far to the right along the screen. So what happens is that the mineral filler drops through to the far left wall of Bin 1 almost imediately, and does not meet very much aggregate falling onto it to push it down the bin to the bottom where the pug mill is waiting to mix the bins into hot mix asphalt. Add in the mineral filler's tendancy to become an almost sticky product and it will start to build up on the left wall of bin one, making a sort of clumb. And as we all know, eventually that clump will be heavy enough to break off of the wall and will make its way into a batch of mix. The problem is that you've had very little mineral filler in most of your batches up until now because it has been collecting in this clump, and now that the clump has made it into a batch... you have a dry batch! It was a hard thing to figure out but needed a very simple fix. To combat this problem, instead of feeding directly into the screen we installed a sort of diving board that feeds the material a foot out before it dumps it onto the screen, alowing for less of the mineral filler to build up high in bin 1. Another way to fight this is to make the left wall of your bin 1 have a steeper slant than the mineral filler needs to stick and stay there. What other solutions have you utilized for this problem?